Heat oven to 375°F. Trim fat from chops. Spoon salsa into a 3-quart rectangular baking dish. Arrange chops on top of salsa. Combine Portobello mushrooms, cheddar cheese and maple syrup in a medium bowl. Spoon over chops. Sprinkle with parsley. 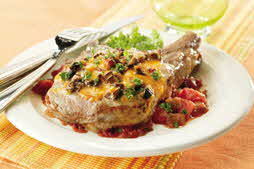 Serve chops with salsa mixture. Take the top prize and win over your dinnertime crowd by serving up the grand-prize-winning recipe of the "No Recipe" recipe contest by Michael Holowis of Pottstown, PA. Serve with a green salad and bread sticks.